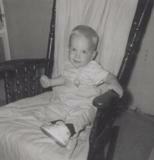 I was born on August 14, 1963, (Yes, I just turned forty this summer!) in Kenora, Ontario. At the time, my dad was working in construction in Kenora, and my mom was there with him when I surprised them by arriving two weeks earlier than expected. When I was three, we moved from our home in Landmark, Manitoba, to the farm close to Arden, Manitoba, where I grew up. I was Mom and Dad’s second son. My older brother’s name is Bradley. I also have two younger sisters, Heather and Cynthia. I grew up on my mom and dad’s mixed farm, where I learned the value of work and the blessings of a close-knit family. I graduated from Neepawa Area Collegiate Institute when I was almost eighteen. I stayed home on the farm for a few months ‘til February of 1982 when I ventured forth to seek my fortune. My first job was on a mixed beef/hog farm close to Kola, Manitoba, just a few miles from the Saskatchewan border. I worked there until the summer of ‘83 when I left Manitoba to attend Bible school at Peace River Bible Institute in north-western Alberta. I took two years toward my Bachelor of Biblical Studies. Then I worked for a year in Edmonton, and in the fall of 1986 I returned to PRBI to finish my three-year degree. I graduated in the spring of ‘87. After I graduated from Bible School, I returned to Manitoba to work on a dairy farm close to Gross Isle. I worked for almost four years on the dairy farm, during which time Lorna and I started our courtship. We had met while I was on tour with a Bible school singing group in my second year. We’d been friends for some time, and in the fall of 1990 our friendship took on a definitely romantic twist... We were married in July of 1991, and we’ve never looked back! Lorna is the light of my life, and I love writing love songs for her.